At 7:00 pm on Thursday, December 15, a solemn Mass for the repose of the soul of Bishop Javier Echevarría was celebrated in the Basilica of St. Eugene. Concelebrating with Msgr. Fernando Ocáriz, Auxiliary Vicar of Opus Dei, were Msgr. Mariano Fazio, Vicar General; Msgr. José Javier Marcos, Secretary Vicar; Msgr. Guillaume Derville, Spiritual Director of the Prelature; Rev. José Velaz, Delegate of Opus Dei for Cameroon, Ivory Coast, and the Congo; Rev. Matteo Fabri, Regional Vicar of Italy; Msgr. Ramón Herrando, Regional Vicar of Spain; Rev. Albert Marianetti, Regional Vicar of India and Sri Lanka; and Msgr. José Andrés Carvajal who, together with Msgr. 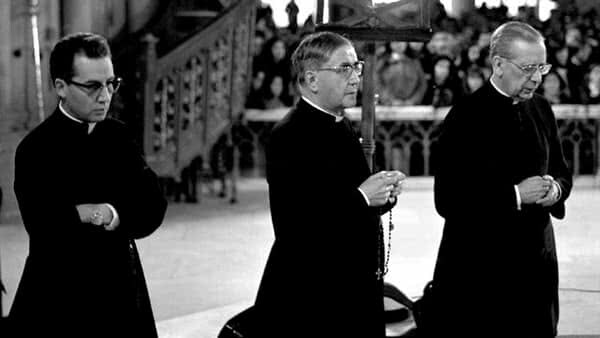 Ocáriz, accompanied the Prelate in his daily life. A great number of people took part, moved by sentiments of gratitude and affection towards the Prelate. 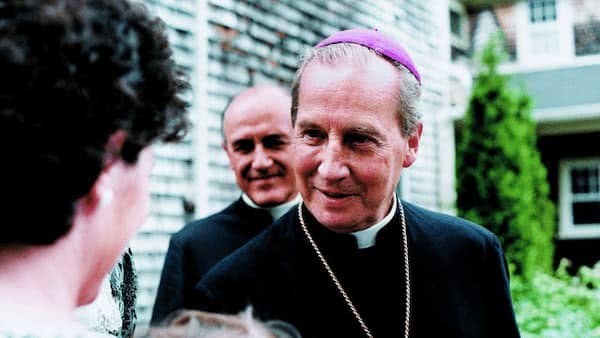 Among them were some relatives of Bishop Echevarría, well-known people from the secular world, cardinals, archbishops, bishops and religious. In this Eucharistic celebration for the repose of the soul of the Prelate of Opus Dei, the Gospel reminds me of the naturalness with which Bishop Javier Echevarría strove to teach us to love Christ and our fellow men and women. No day went by in which he failed to comment on some passage from the Liturgy of the Word or from the other texts at Mass. He did so, of course, in meditations and spiritual talks, but also in the midst of the simplicity of daily life. Thus he would pause to pray and invite those around him to pray for a trip of the Pope, for peace in Syria, for the victims of natural disasters, for refugees, for the unemployed, for the sick (for whom he always had a special predilection that he learned from Saint Josemaría). On returning from a long trip, before coming home, he would sometimes stop at the hospital to visit a person who was sick. Everyone had a place in his heart. He faced a great challenge: being the successor of two saints, Saint Josemaría and Blessed Alvaro del Portillo. He was convinced he wasn’t up to the task. But at the same time he had the spiritual strength and courage to go forward, to never lose hope, since he was one of the “little ones” to whom our Lord had revealed the mystery of his love (cf. Mt 11:29). He came to know the love of Christ in his youth. First, in his family home. Then, with the great light brought into his life by his encounter with Saint Josemaría, he discovered more deeply the beauty of Christ’s love. He used to recall how, a few days after first meeting Saint Josemaría, he went with him and several others in a car. There he heard him sing a popular song about human love, which Saint Josemaría raised to the divine plane: Tengo un amor que me llena de alegría, y es este amor la ilusión de cada día. “I have a love that fills me with joy, a love that enkindles my heart with hope each day.” He understood that this love was God’s Love for us, and that the Holy Spirit infuses in our heart the love we need to love God and others. “My yoke is easy, and my burden light” (Mt 11:30), Jesus says, because his yoke is love. “This is my commandment, that you love one another as I have loved you” (Jn 15:12). Following Saint Josemaría’s example and teachings, Javier Echevarría was a man with a big heart, able to forgive and ask for forgiveness. He was a great lover of the sacrament of Reconciliation and Penance, where we let Jesus enter our soul, and we experience “the full freedom of the love with which God enters into the life of every person,”  as our Holy Father Francis writes. St. Josemaría, The Way, no. 961. St. Josemaría, Conversations, no. 70. Vatican II, Decree Presbyterorum Ordinis, no. 5. Pope Francis, Apostolic Letter, Misericordia et Misera, November 20, 2016, no. 2. Romana, No. 63, July-December 2016, p. 235-242.